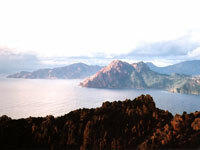 The Cape Girolata peninsula is classified as a UNESCO World Heritage Site and encompasses the Scandola Nature Reserve, an ecological treasure covering 1,000 hectares (2,471 acres) of scrub, cliffs and sea. The promontory is marked by incredible rock formations that were formed by Monte Cinto's volcanic eruptions millions of years ago. The subsequent erosion has fashioned remarkable caves and grottoes deep into the rock. The headland and its surrounding waters support significant colonies of seabirds, dolphins and seals, as well as 450 types of seaweed and some remarkable fish such as the grouper, a species more commonly found in the Caribbean. Due to its valuable biodiversity and landscape Scandola is off-limits to walkers and can be viewed only by boat; trips can be arranged from Calvi, Porto and Ajaccio and make for amazing excursions. Visitors can spend the whole day on a boat tour, stopping off in a picturesque little village for lunch. Equally, one can go for a quick two to three hour jaunt if time is limited. It is also possible to hire boats but it is expensive.